V2324. 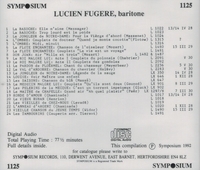 LUCIEN FUGÈRE: Song & Opera Recital. 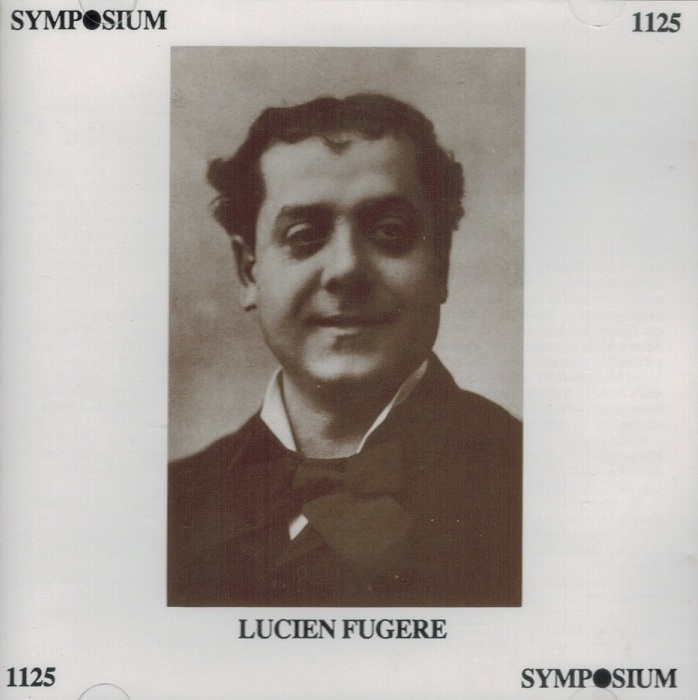 (England) Symposium 1125, recorded 1928-30, from the celebrated Columbia electrical recordings. Very long out-of-print, Final Copy! 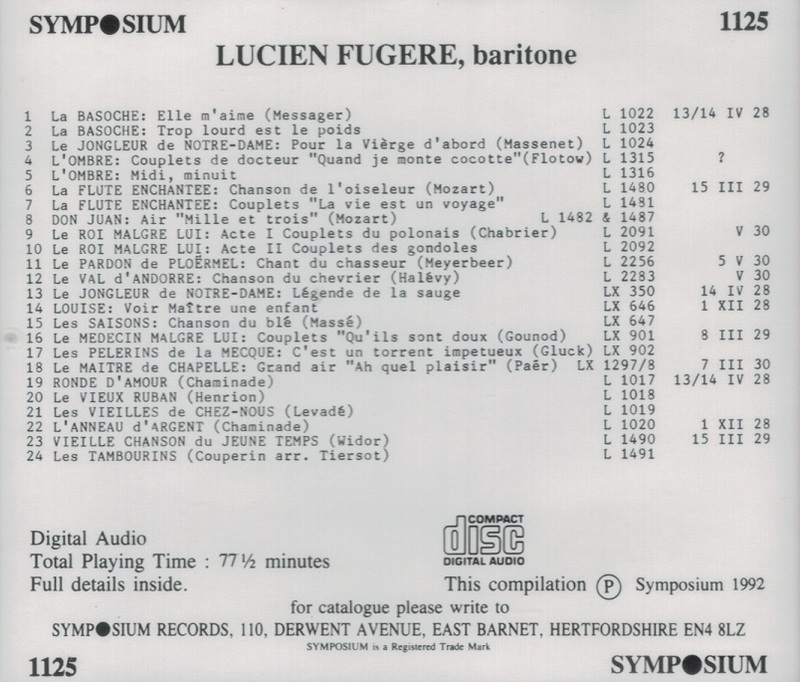 “Lucien Fugère was a French baritone, particularly associated with the French repertory and Mozart roles, he enjoyed an exceptionally long career, singing into his 80s. Fugère was working as a jewellery representative when he decided to try his luck at a career in music. After taking private voice lessons (he was refused by the Paris Conservatory) he made his début as a chansonnier at the Bataclan in 1870. He then made his début in operetta at the Théâtre des Bouffes Parisiens, in 1874, in LA BRANCHE CASSÉE by Serpette. In addition Fugère sang in LA BOITE AU LAIT, MADAME L'ARCHIDUC, LE MOULIN DU VENT-GALANT and LA CRÉOLE at the Bouffes. The turning point of his career came in 1877, when he made his début at the Opéra-Comique, as Jean, in LES NOCES DE JEANNETTE by Victor Massé. He was to perform there regularly until 1920, creating roles in more than 30 operas, notably, the father in LOUISE by Gustave Charpentier, Fritelli in LE ROI MALGRÉ LUI by Emmanuel Chabrier, and for Jules Massenet, Pandolfe in CENDRILLON, the Devil in GRISÉLIDIS, des Grieux in LE PORTRAIT DE MANON, Sancho in DON QUICHOTTE, Boniface in LE JONGLEUR DE NOTRE-DAME, and for André Messager, Maitre André in FORTUNIO, Buvat in LE CHEVALIER D'HARMENTAL, and le Duc de Longueville in LA BASOCHE. In total he sang in over 100 roles including Mozart's Figaro, Leporello, Papageno, Falstaff, and appeared at the Gaîté-Lyrique from 1908 until 1919. Two Chabrier songs are dedicated to Fugère: ‘Sommation irrespectueuse’ and ‘Pastorales des cochons roses’, giving the premiere of the latter in 1890. In 1898, having sung at the re-opening of the Salle Favart, Fugère was presented to President Faure from whom he received the Cross of the Chevalier of the Légion d’Honneur. Fugère sang le Duc de Longueville one last time at the Opéra-Comique in 1929, and his final performance on stage was as Rossini's Bartolo, at the Théâtre Trianon-Lyrique, in 1933, at the age of 85.